Summary: Researchers report our visual attentoin pays most attention to parts of a scene that have meaning to us, not the parts that stick out. UC Davis “Visual Brain Drawn to Meaning, Not What Stands Out.” NeuroscienceNews. NeuroscienceNews, 25 September 2017. UC Davis “Visual Brain Drawn to Meaning, Not What Stands Out.” http://neurosciencenews.com/meaning-visual-brain-7580/ (accessed September 25, 2017). Real-world scenes comprise a blooming, buzzing confusion of information. 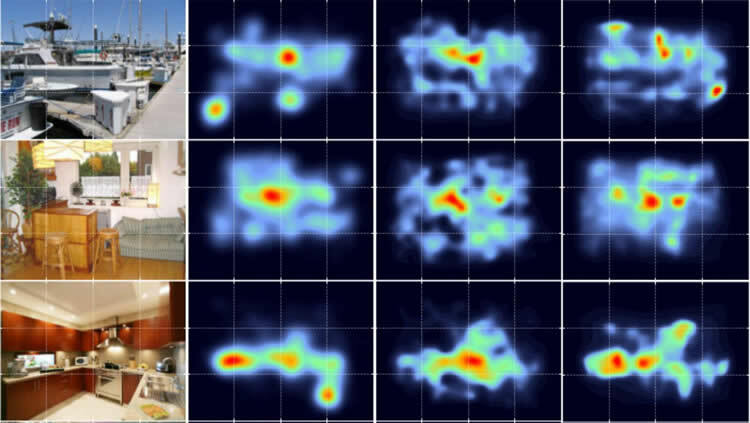 To manage this complexity, visual attention is guided to important scene regions in real time. What factors guide attention within scenes? A leading theoretical position suggests that visual salience based on semantically uninterpreted image features plays the critical causal role in attentional guidance, with knowledge and meaning playing a secondary or modulatory role. Here we propose instead that meaning plays the dominant role in guiding human attention through scenes. To test this proposal, we developed ‘meaning maps’ that represent the semantic richness of scene regions in a format that can be directly compared to image salience. We then contrasted the degree to which the spatial distributions of meaning and salience predict viewers’ overt attention within scenes. The results showed that both meaning and salience predicted the distribution of attention, but that when the relationship between meaning and salience was controlled, only meaning accounted for unique variance in attention. This pattern of results was apparent from the very earliest time-point in scene viewing. We conclude that meaning is the driving force guiding attention through real-world scenes.